This post and headline have been updated with additional information from the Department of Defense. While Mason fired counter-measures to protect itself, it is yet unconfirmed if the suspected threats are cruise missiles or originated in Yemen. 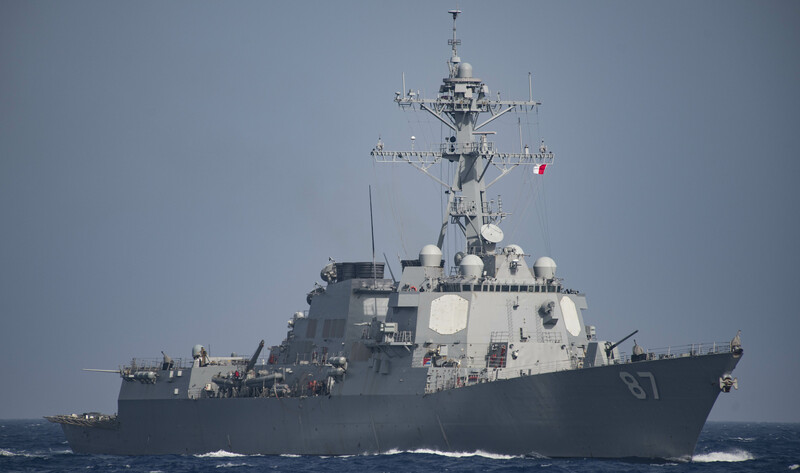 USS Mason (DDG-87) — operating in the Red Sea, north of the Bab el-Mandeb strait — believes to have fired upon by multiple coastal defense missiles, a Navy official told USNI News. Mason used defensive counter measures to counter the apparent attack and the ship and crew were unharmed, the official said. Following the Baltimore commissioning ceremony of guided missile destroyer USS Zumwalt (DDG-1000), Richardson confirmed some details on the apparent attack to reporters. In a late Saturday statement to USNI News, Pentagon spokesman Cmdr. Gary Ross said U.S. ships launched countermeasures to defend against an apparent attack. “Earlier today, a U.S. Strike Group transiting international waters in the Red Sea detected possible inbound missile threats and deployed appropriate defensive countermeasures,” Ross said in a statement. The latest attack on Mason follows a Wednesday retaliatory strike in response to earlier attacks on the ship. Guided-missile destroyer USS Nitze (DDG-94) fired several Tomahawk Land Attack Missiles into Yemen to target three Houthi radar sites the U.S. said were used to provide information target the anti-ship missiles used in the previous attacks, Pentagon officials told USNI News earlier this week. “The United States will respond to any further threat to our ships and commercial traffic, as appropriate, and will continue to maintain our freedom of navigation in the Red Sea, the Bab al-Mandeb, and elsewhere around the world,” he said. Mason, Nitze and USS Ponce (AFSB(I)-15) have been operating in the vicinity of Bab el-Mandeb strait following the Oct. 1 attack that destroyed the high-speed logistics vessel HSV Swift operated by the UAE. The attacks on Mason and Swfit are believed to have been launched by Iran-backed Houthi rebels using Chinese-built C-802 anti-ship cruise missiles supplied by Tehran. While the Pentagon is reluctant to discuss the countermeasures the ship used, at least during the first attack on Mason the ship’s crew fired Standard Missile 2s and an Evolved Seasparrow Missile (ESSM) to counter the threat, USNI News reported. “They have everything that they need to defend themselves from these attacks and respond when needed and so we’re proud of the crews – they’ve done terrific,” Richardson told reporters. The following is the Oct. 15, 2016 Pentagon statement provided to USNI News on the apparent attack on USS Mason. Earlier today a U.S. Strike Group transiting international waters in the Red Sea detected possible inbound missile threats and deployed appropriate defensive countermeasures. Our sailors and ships are unharmed, and we are still assessing the situation. We will continue to defend freedom of navigation in this critical waterway, and we will take all necessary steps to respond to threats and defend our personnel and ships.